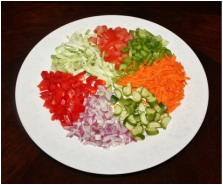 Beans are the important part of Indian daily diet and mix bean salad is a tasty way to include beans in daily meals. 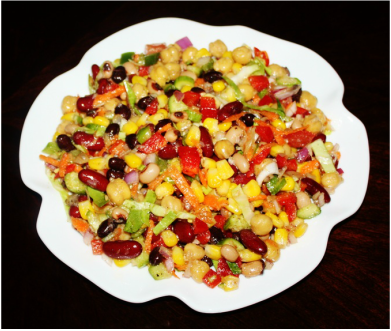 Mix bean salad is versatile you can choose beans and vegetables of your choice and each time you toss the salad you can change the flavor to suit your taste buds, for instance, you can give it a lemony tang by sprinkling lemon juice on it or make it zesty with balsamic vinegar or olive oil and vinegar dressing, It's up to you! chat masala and lemon Juice and mix. overnight and boil them in a pressure cooker. beans in the colander for few minutes so that all water drains out. 3. 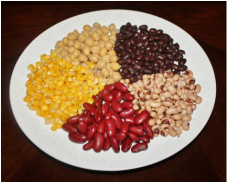 Take a bowl, add all boiled beans and boiled corn. 4. Mix all the chopped vegetables into the beans. 5. Pour dressing over beans and vegetables and mix. 6. Refrigerate several hours before serving. 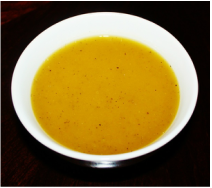 and to allow the beans to soak up the flavor of the spices and dressing. 1. 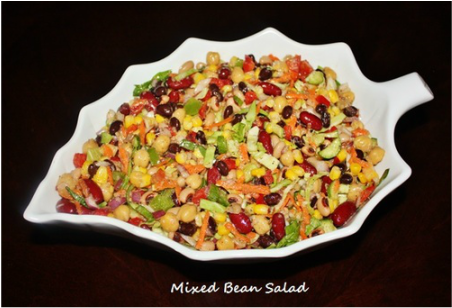 Instead of boiling the beans you could use canned beans for salad. or just sprinkle lemon juice and spices. beans and soak them over night then boil them in pressure cooker.